A new NetEnt Casino has made it to the exclusive list we are offering on NetentCasinos.com and I truly believe it’s the coolest place to hang out if you’re into online casino games. Your room temperature might drop a few degrees the moment you enter Eskimo Casino, but instead, you have access to an easy-to-use online casino platform with no distractions whatsoever. It’s one of my favourite sentences, although I normally use it to describe a NetEnt slot. This time it totally fits a NetEnt Casino. 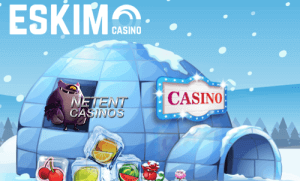 Eskimo Casino is new to our list of NetEnt Casinos and deserves a proper introduction. Only available in English, I’m sure many English speaking players will find their way around this platform which isn’t that difficult. Simplicity seems key at Eskimo Casino which results in a user-friendly platform. Although Eskimo Casino offers hundreds of online casino games, you don’t have to worry about a maze of games. 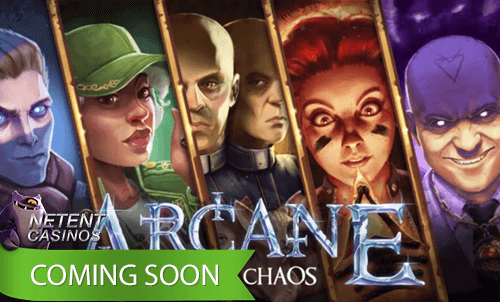 Five casino game categories and a search option are what you can expect at this very cool NetEnt Casino. I’m sure a large group of online casino players will appreciate the tranquillity this simple layout at Eskimo Casino creates. It’s all about the online casino games and no banners or sliders will be provided. Of course, you’ll be presented a few extra categories as soon as you enter the site with some of the most popular NetEnt Games shown first. 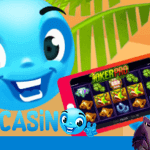 Eskimo Casino is proving players a very wide selection of the coolest, highest-quality online casino games including table games, slots, video slots, live casino games, and jackpot games. And as Eskimo Casino says: “There’s not a snowball’s chance in hell we won’t have something to suit your online casino gaming needs”. It appears to me that Eskimo Casino values customer service and Customer is King at this NetEnt Casino. They know about the player’s needs and you can offer many hundreds of casino games, if no service is provided to the player, you’ll see them closing their account as fast as they opened it. No successful online casino without a top-notch service! A wide range of high-quality online casino games and a great service isn’t all a player needs to have a good time at an online casino. There’s one aspect an online casino should have as their main priority which is safety! Safety always comes first and I would never add a new NetEnt Casino without checking their license and reliability. Granted a casino license by the Malta Gaming Authority (MGA), the gaming authority indicated Eskimo Casino as 100% reliable and so do I.
Don’t be worried about the temperatures being sub-zero at Eskimo Casino as their sign-up bonus and deposit bonuses will definitely warm you up instantly. An amazing 10 no deposit free spins will be available straight away after your registration while a 100% first deposit bonus award players with up to €100 in extra play money while another 100 free spins will be activated at the same time. Your additional 100 Free Spins will be available for Starburst™, Joker Pro™, Aloha!™, The Legend of Shangri-La™, Wild Wild West™ or Finn and the Swirly Spin™. Eskimo Casino delivers a user-friendly platform with no nonsense distracting you from what is most important: playing online casino games. With the entire NetEnt Games suite available at Eskimo Casino, you don’t have to worry about boredom. Plus you can look forward to a 24/7 top-notch customer service, a great selection of payment options, a warm welcome bonus offer while your safety is guaranteed as well.